Since its founding in 1900, the Yale School of Forestry & Environmental Studies has been in the forefront of developing a science-based approach to forest management, and in training leaders world-wide. The Global Institute of Sustainable Forestry, established in 2000, continues this tradition. It’s mission is to integrate, strengthen and direct the School’s forestry research, education and outreach to address the challenges of sustaining forests in the 21st century and a globalized world. The Institute is housed in Marsh Hall, a four-story brownstone historic house that was built in 1878 and designed by J. Cleaveland Cady as the residence of Yale professor and paleontologist Othniel Marsh. 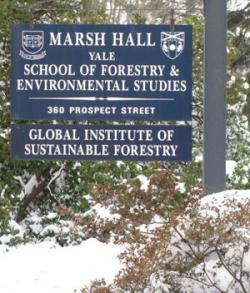 Marsh left his estate to the university in 1899 and it became the first facility of the Yale School of Forestry. The property was declared a National Historic Landmark in 1965.